FreeStyleGames was always a bit of an underrated studio in my eyes. Specialising in rhythm action games, this British outfit was responsible for both fantastic DJ Hero titles, as well as the brilliant Guitar Hero Live. Unfortunately, DJ Hero and DJ Hero 2 were released at a time when the plastic instrument craze was beginning to die, and Guitar Hero Live – an attempt to resurrect it – didn’t quite manage this. It’s a real shame, because all three games are among my favourites in the rhythm action genre. I doff my cap to you, FreeStyleGames, you fallen geniuses (Activision made 50 staff redundant in 2016 and the studio was eventually bought by Ubisoft and renamed Ubisoft Leamington). 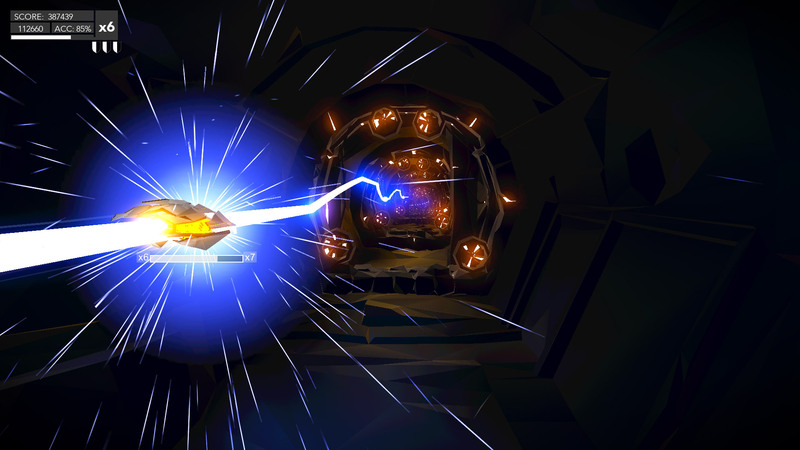 The point is that Aaero is the work of Paul Norris and Dan Horbury, who were the Music Team Lead and Senior Engine Programmers respectively at FreeStyleGames. And that’s why you should be paying attention to it. 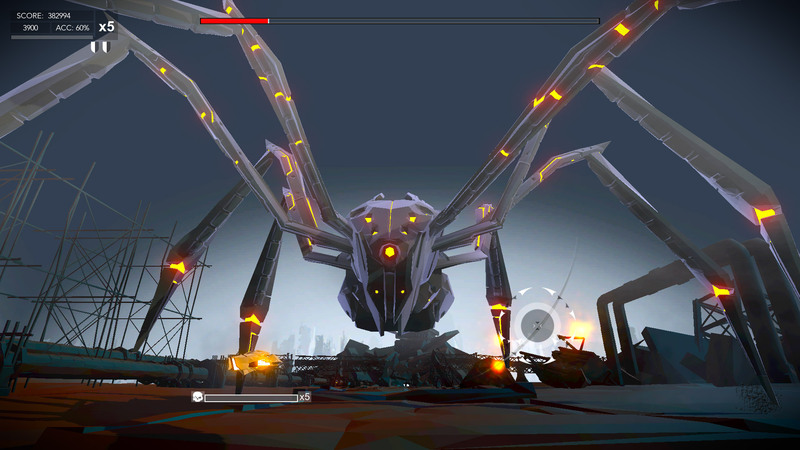 I’d describe Aaero as a cross between classic rail shooter Rez, DJ Hero and old-school arcade shooter Tempest. It’s a rhythm shooter in which you control a small spaceship, and it consists of two main play styles. The first of these are the shooting sections, in which you have to take out a series of flying enemies with your homing missiles. These are the parts that play like Rez: your movement is on rails and you have to ‘lock on’ to your foes and the projectiles they fire at you before triggering your weapon to blow them up. As in Rez, you can lock on to a number of targets at once. And, as in Rez, when you fire the explosion is timed to the beat of the music, creating a sort of synaesthesia where the sounds and your actions merge into one. The other parts of the stage generally take place when you enter a tunnel. At this point you have to move your ship around and trace over ribbons of light that appear. These ribbons bend depending on the music, so moving along them feels like the bits in DJ Hero where you move the slider to jump from track to track. They’re also positioned around a circular diameter, meaning you follow them them by moving the analogue stick to its limit and turning it round like a wheel (which is where the Tempest feel comes in). And sometimes, especially on harder levels, the game will combine both, asking you to trace the ribbons while simultaneously shooting enemies. I appreciate this is hard to picture, so here’s a little montage of gameplay footage I took from a few levels so you can see the shooting sections and the ribbon-tracing sections in action. Oh, and turn the sound up. Get it now? Good. 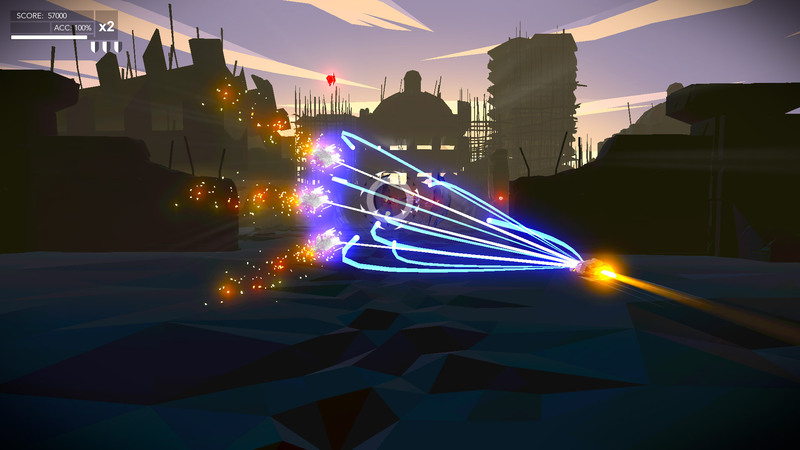 So yup, that’s Aaero, and I really like it… though it isn’t without its little quirks. Most notable are the occasional performance dips. There are times (at least in the Xbox One version, which is the one I played) where the picture will freeze for a split-second while the game continues in the background. In any other type of game this would be painless but in a rhythm one, where timing is crucial, it can be a ball-ache: especially during the ribbon-tracing sections, where coming off one can really throw you off. These are thankfully relatively infrequent, but it happens enough to be worth noting – expect a bad one every 10-15 levels or so – so hopefully a patch will come to fix it in the future. The shooting sections can also sometimes be a tiny bit frustrating when it isn’t clear what you’ve targeted. I’ve died far too many times by a missile because I thought I’d locked onto it, only to find I hadn’t and it was too late to fire again. This can be lessened by actually waiting for attacks and targeting them first, but it’s unrealistic to expect this when the action gets intense. Finally, this isn’t really a bad point – just something worth mentioning – but in case you couldn’t already tell by the video, if you don’t like dubstep you aren’t going to like the music on offer here. I had no issue with it whatsoever and thought all 15 tracks were good stuff, but just bear that in mind. Again, the video above should be a good way of gauging whether you’ll be into it. None of this was enough to ruin Aaero for me, and I’ve had a great time playing through it. Although there are only 15 levels, there’s still plenty to do: as well as trying to get five stars on each (the higher your score, the better your rank), there are also secret red objects to find and shoot as you play. Then, when you’ve got all the stars and secret objects, you get to do it all over again on two harder difficulty levels. Finding all 100 secrets and earning all 225 stars will take you a hell of a long time, so it’ll keep you busy. I hope Aaero gets a sequel because I’d like to see more of it. I’d like more than just 15 tracks and I’d like more diversity in its environments, which look fantastic but familiar, but for a £11.99 / $14.99 download you’ll get your money’s worth. 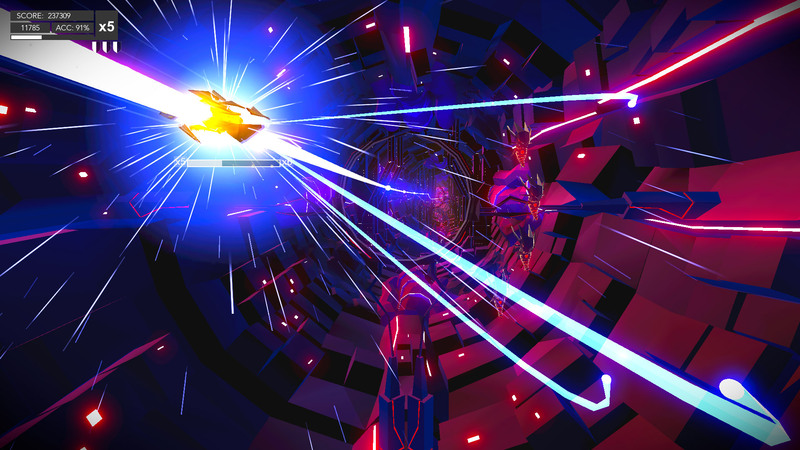 That Aaero was put together by just two men (with some help from a third) is one hell of a feat, putting many rhythm games by much larger teams to shame. It isn’t without its flaws, but anyone who longs for a sequel to Rez should enjoy what’s on offer here. Aaero is out now on Xbox One, PS4 and Steam. This review was not based on a review copy of the game. I bought and received a copy early for backing it on Kickstarter. Despite my backing of the game to help get it released, the content of my review and the opinions therein were in no way positively influenced by this.